YES! This is the service I’ve been looking for. Start my risk-free membership to the OFFICE TECHNOLOGY TODAY Answer Center, which includes my OFFICE TECHNOLOGY TODAY online newsletter. Also, rush me my free Special Report, 59 Technology Tips for the Administrative Professional, and my Executive Summary, Microsoft Outlook 2010: Beyond E-mail to E-fficiency. If I don’t immediately benefit from the tools and advice in the OFFICE TECHNOLOGY TODAY Answer Center, you’ll refund the entire fee. I’ll keep my two FREE bonuses, and have no further obligation. Yes, I'm ready to squeeze the maximum value out of my office technology investment. People use only 10% of their brain power. And the same is true of your office technology. Chances are, you’re only scratching the surface of what your office software can do for you. Shouldn’t you get the FULL POWER of the programs you’ve already bought and paid for? We think so. That’s why we produce the monthly OFFICE TECHNOLOGY TODAY newsletter, and our popular Office Technology webinar series. But to keep you continually updated on the latest in office tech, we’re excited to introduce the OFFICE TECHNOLOGY TODAY Answer Center. Excel . You know about Excel’s spreadsheet functions, but that’s just the start. From pivot tables to macros, databases to templates and more, we’ll show you how to wring more out of this powerful program than you ever dreamed possible. Word. We all use MS Word to write memos and documents. But did you know about its robust design features? Are you aware of the shortcuts that can save you valuable time? What about Word macros? Our experts will show you features you never knew existed! Outlook. Perhaps no other program is used – and underused – as often as Outlook. Sure, you can send emails. But Outlook also contains potent scheduling and calendaring functions … records management applications … helpful keyboard shortcuts … and more. The OFFICE TECHNOLOGY TODAY Answer Center will show you how to use them all. PowerPoint. Nothing’s greater for presentations. But we can help you make your presentations greater. Unleash the power of PowerPoint with our invaluable tips on design, formatting, Word interface, and even animation. Boost your creativity – and your marketability! Access. Many people are intimidated by MS Access. But the experts at the OFFICE TECHNOLOGY TODAY Answer Center have tamed this monster for you. Now you can easily get data into the program … get helpful reports out of it … perform basic queries … and more. Beyond Software. Do you need information on the latest mobile apps to decide if they’re right for you? Are you curious about how to transform social media into a productive, business-boosting function? Trust the OFFICE TECHNOLOGY TODAY Answer Center for the solutions you need. Video Training. The OFFICE TECHNOLOGY TODAY Answer Center provides a collection of advice-packed training videos with live action, audio, and on-screen animation to show you how to get the maximum benefit out of our featured program. You’ll be able to hear how to better use your programs … and actually see it happening on the screen. And we add a new training video to the collection every month! Audio Narration. For every video, our expert presenters provide step-by-step explanations of what's happening on the screen. You and your team will be able to hear the lesson as well as see it – and stop the action at any time, so you can learn at your own pace. Executive Summaries. We don’t just provide audio and video training. The Answer Center also transcribes our office technology webinars, and provides them as Executive Summaries along with informative screen shots. Newsletter Subscription AND Article Archives. As an Answer Center member, you’ll also receive our monthly OFFICE TECHNOLOGY TODAY newsletter, and enjoy access to our electronic archive of hundreds of helpful articles and tips on a wide variety of office tech topics. The “Help Desk.” Sometimes, there’s no substitute for custom training. That’s why OFFICE TECHNOLOGY TODAY Answer Center members can tap into the expertise of office tech expert Melissa Esquibel – editor of OFFICE TECHNOLOGY TODAY and a frequent webinar presenter – for answers to their technology questions. Just email Melissa, and she’ll put her 25 years of tech training knowledge to work for you with the on-target answers you need. Imagine what you’d pay for a service like this – yet it’s all included as part of your OFFICE TECHNOLOGY TODAY Answer Center membership! So whether you learn best by watching … by listening … by reading … or by asking, the OFFICE TECHNOLOGY TODAY Answer Center has your training needs covered. 1. Full Website Access. Comprehensive, members-only access to our training videos, podcasts, articles, and Executive Summaries on the office technology topics that impact YOU. 2. 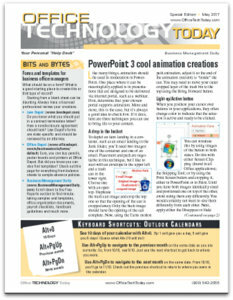 A subscription to the popular OFFICE TECHNOLOGY TODAY newsletter. Monthly updates on software, mobile apps, productivity tips, and more. 3. The Help Desk. Ask office technology expert Melissa Esquibel your questions, get customized answers, and read all the past Q&As from your peers. 4. A FREE E-letter. Every issue of our Office Technology e-letter focuses on one specific tech topic – giving you the answers you need. It’s also yours FREE as an OFFICE TECHNOLOGY TODAY Answer Center member. 5. A FREE Special Report. 59 Technology Tips for the Administrative Professional teaches you shortcuts on your most popular software programs, and includes dozens of helpful online tips AND a list of mobile apps that are not just fun, but free! You’ll receive this download – a $39.95 value – FREE as an OFFICE TECHNOLOGY TODAY Answer Center member. 6. A FREE Executive Summary. Microsoft Outlook 2010: Beyond E-mail to E-fficiency, our most popular Executive Summary, will show you how to squeeze optimum value from this powerful program. This is a $39.95 value, but we’ll send you the PDF download FREE as an OFFICE TECHNOLOGY TODAY Answer Center member. 7. An Unconditional Money-Back Guarantee. Try the OFFICE TECHNOLOGY TODAY Answer Center. Watch a training video. Listen to a podcast. Ask Melissa a question. If you decide that the Answer Center isn’t all we’ve promised – and MORE – we will issue a 100% refund – every penny you paid. Your FREE Executive Summary and Special Report are both yours to keep. It’s that simple. Are you really using only 10% of your office technology’s capability? Whatever the figure, the OFFICE TECHNOLOGY TODAY Answer Center will help you get more out of the software you’ve already bought and paid for. In fact, we guarantee it. I look forward to welcoming you to the OFFICE TECHNOLOGY TODAY Answer Center! P.S. There's zero risk – and zero cost. Remember: You can try the OFFICE TECHNOLOGY TODAY Answer Center for 30 days at no obligation whatsoever. If you don’t like the service, just call and cancel. You owe nothing – but your FREE Special Report, 59 Technology Tips for the Administrative Professional, and your Executive Summary, Microsoft Outlook 2010: Beyond E-mail to E-fficiency, are yours to keep. No hassles, no questions asked. P.P.S. Try annual or quarterly service. You can join the Answer Center for a year at a time for your best deal, or take advantage of our quarterly option.